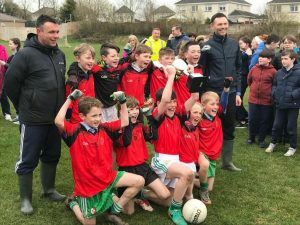 Congratulations to the Scoil Mhuire Mini Sevens who won the Kildare final yesterday. Included in the team of ten were Mini Moores Darragh Boothe (captain), Adam Poole, Nathan McCauley, Ronan Collins and Karl Shelly. Also involved was our own Mini Moores mentor Victor Logan.